Not long, folks, before September 26 comes around and we can all go down to the shops to buy a copy of Halo 3. 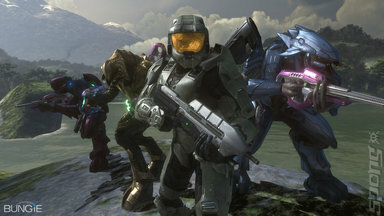 An exciting prospect, for sure: but what will Halo 3 actually be like, and does it deserve the hype, which will build up to a fever-pitch over the next month? As ever, Microsoft and Bungie have been keeping all things Halo-related annoyingly under wraps, but we were able to tag along on a Halo 3 event Microsoft threw for mainstream press in that most civilised of cities (where not only can you smoke inside while drinking a beer, but you can construct then inhale Camberwell carrots, all perfectly legally): Amsterdam. The event itself was mildly entertaining: Microsoft shipped the assorted scribblers to a bizarre man-made island in one of the waterways surrounding Amsterdam, for a spot of laser-shooting and crossbow target practice, before packing us onto a huge boat rammed with Xbox 360s which steamed in a leisurely fashion back to the hotel. 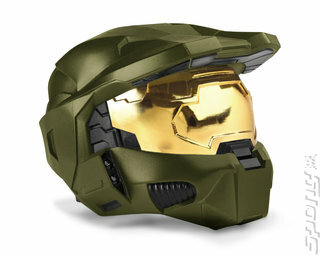 A press conference whipped up the expected hype, with Microsoft pointing out that Halo 2 generated $125 million (£63m) in sales in its first 24 hours, and adding that it hopes Halo 3 will break the record for an opening weekend of $151 million (£76m), held by Spider-Man 3. That should help ease that billion-dollar Ring of Death bill, then. 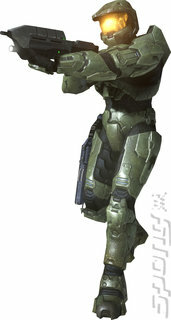 The other feature Microsoft and Bungie were keen to push was a machinima-style playback engine that lets you rewind to the best moments during your Halo 3 games, and preserve them as video (although recreated in the game engine), with flashy effects like 3D fly-arounds and so on. This should be responsible for completely clogging up YouTube come the end of September. Mention was also made of some of the new vehicles, notably the giant tanks, which apparently add a new dimension to the multi-player game, and which can accommodate large amounts of players, and the motorbike-like Chopper. But what of the game? I got a decent amount of hands-on time in one of the single-player levels, and the most striking aspect was how reassuringly familiar (in terms of both game-play and visual style, despite the jump to the Xbox 360) it all was. Face it, though: if you were Bungie, would you mess around with a winning formula? The level I played started off with some decent Warthog action, stopping every so often to pick off pockets of the Covenant. I noticed a few detail improvements, such as turret guns that could be detached to form a two-handed weapon packing enough of a punch to take out armoured enemy vehicles although, naturally, it swiftly ran out of ammo once detached. And I was pretty keen on the Chopper, which looks like something a Hell’s Angel would ride and has a huge, double front wheel that lets it traverse terrain that would topple a Warthog. And, best of all, its gun packed a serious punch – ideal for taking on static gun emplacements. 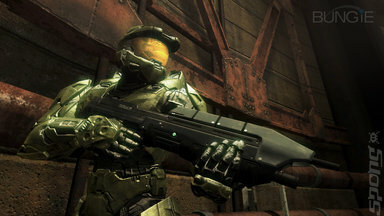 The length of the level was also notable: Halo 3 should be a seriously meaty game, as you would expect from the final part of the trilogy, which will wrap up the overarching storyline from Halo and Halo 2. Whether it attracts criticism for being too similar to its predecessors remains to be seen, but I’d venture that such carping would be a tad harsh. It’s Halo, damn it! And this means pure gaming pleasure. Now read on to see what Head of Game Development for Microsoft Game Studios, Phil Spencer, has to say about the game.